First published in June 1921, Books+Publishing has been a vital source of news, reviews and insight into the book industry for almost 100 years. In celebration of our 100th birthday in 2021, Books+Publishing magazine has been updated with a clean and classic design that reflects our history and looks to the future. In the lead-up to 2021, each edition of our print magazine will include a focus on different aspects of the publishing cycle. In 2019, features focused on authors, editors, designers, and sales and marketing staff will be included among our regular reporting and analysis of industry trends and events. In our first issue of Books+Publishing for the year, we are focusing on authors. We look at the author income and hear from the Australian Society of Authors; in Junior, you’ll find reports on author speakers’ agencies and unpublished manuscript prizes. We also welcome this year’s new columnist Jane Curry and Junior columnist Karys McEwen, and introduce rejuvenated news pages in both sections. Join us in celebrating 100 years of Books+Publishing and our vibrant publishing industry. Books+Publishing magazine’s first issue of 2019 is out now! It features 36 reviews of forthcoming adult and children’s books due to be published between April and June 2019. Two nonfiction titles received five stars from reviewers: Sarah Maddison’s The Colonial Fantasy: Why White Australia Can’t Solve Black Problems (A&U), and Tom Doig’s Hazelwood (Viking). Another two were awarded four-and-a-half stars: Sophie Cunningham’s City of Trees: Essays on Life, Death and the Need for a Forest (Text) and Growing up African in Australia (ed by Maxine Beneba Clarke, Black Inc.). Features: In the wake of the highly publicised restructure of Melbourne University Publishing, Sarah Farquharson speaks to Australian university presses about the state of the sector; our new columnist Jane Curry shares her thoughts on what makes a good author; Elizabeth Flux talks to four authors about the struggle to make ends meet through writing; and Kelsey Oldham explores the market for art and design publishing in Australia. Also in this issue, Riverbend Books events manager Vicky Tosh shares the joys and hiccups of managing author events, ASA CEO Juliet Rogers shares some of the organisation’s history and plans for the future; and booksellers talk to Kelsey Oldham about stocking works by self-published authors. 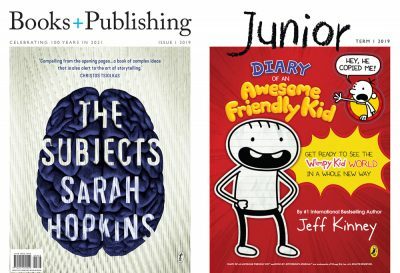 Reviews: Of the 18 children’s and YA titles reviewed in Junior, two books received five stars from reviewers: Davina Bell’s younger readers title Sophia and the Corner Park Clubhouse (HGE), ‘a heartwarming story about four close friends set against the backdrop of a charmingly eccentric small town’; and Helena Fox’s YA novel How it Feels to Float (Pan), ‘a visceral reading experience that captures the way in which many teens struggle with mental illness’. Another two books received four-and-a-half stars: the picture book One Tree (Christopher Cheng, illus by Bruce Whatley, Puffin); and the YA novel Mindcull (K H Canobi, Ford Street). Features: Sarah Farquharson reports on the state of international rights sales of Indigenous-authored books; Karys McEwen argues for the benefit of young people interacting with authors; Jackie Tang investigates unpublished manuscript prizes and their career-making impact on debut authors; and Andrea Hanke chats to authors speakers’ agencies about getting kids interested in reading. Don’t miss our regular features: editor’s picks and book bites.